Before synchronizing records between ALM Octane and ALM, adapt the data in either endpoint to match the fields supported in the other endpoint, as well as synchronization requirements. For example, ALM Octane defects can also be associated with a feature. To synchronize this field, you must create a corresponding user-defined field in ALM. In ALM Octane, user stories are often arranged in a hierarchy, under features and epics. To synchronize these records and their hierarchy with ALM, you must create a corresponding hierarchy of requirement types. In both endpoints, we recommend creating user-defined or custom fields to represent the record ID in the other endpoint. Define these fields as Number or Numeric fields. In ALM, create a field named ALM Octane ID. In ALM Octane, create a field named ALM or QC ID. Later, map these corresponding fields in the link's Field Mapping tab. For details, see Edit field mapping. the entire ALM Requirements root folder, including sub-folders. all current releases (with an end date that has not yet passed) in the ALMReleases root folder, including sub-folders. To synchronize only a subset of the requirements or releases in your ALM project, you can specify an alternate root folder in the synchronization link. Note: If you use both favorites and alternate root folders, Synchronizer considers the alternate root folder before the favorites. In the ALM project's tree, create a sub-folder that contains only the requirements or releases that you want to synchronize. This sub-folder can also include additional sub-folders. The user stories in ALM OctaneWorkspace1 are synchronized with the requirements in the ALMAG_Project1 folder instead of the Requirements folder. The user stories in ALM OctaneWorkspace2 are synchronized with the requirements in the ALMAG_Project2 folder instead of the Requirements folder. In both ALM projects, other folders in the Requirements folder are ignored by ALM Octane Synchronizer. If there are additional sub-folders under the AG_ProjectX folders, all mapped requirement types they contain are synchronized. You could similarly set up an alternate root folder for releases. For details on defining the alternate root folder in your synchronization link, see Optional (ALM only): Define an alternate root folder (requirement and release links). Decide on ALM requirement types that represent ALM Octane epics, features, and user stories, and arrange them in a hierarchy that matches the one in ALM Octane. You can map one or more ALM requirement types to each of the ALM Octane types: user story, feature. You can map only one ALM requirement type to ALM Octane epics. If you do not map a specific ALM requirement type, requirements of that type are not synchronized. ALM Octane quality stories are not synchronized. If your ALM hierarchy does not match the ALM Octane hierarchy, Synchronizer can synchronize requirements directly to the root of ALM Octane's backlog tree. This is relevant only for requirements mapped to epics or user stories. For details, see Optional: Specify how to handle requirements whose hierarchy does not match the backlog tree (requirement links). You do not map all requirement types, including Epic, Feature, and User Story. Synchronized requirements are not located in the correct location in the ALM hierarchy. For example, if a feature requirement is located under a user story requirement in the ALM requirement tree. You change a requirement's type after it was synchronized. If needed, create new user-defined requirement types in ALM customization. Note: You can include requirements of type Folder in your hierarchy. These are considered requirement sub-folders. Folder type requirements are not synchronized, but the requirements they contain are synchronized. Use the ALM's out-of-the-box Business requirement type to represent epics. Use ALM's out-of-the-box Functional requirement type to represent features. Create a new User Story requirement type in ALM to represent user stories. Create or modify the requirement tree with a maximum of three levels (representing epics, features, and user stories). Requirements synchronized with epics must be at the top of the hierarchy. Requirements synchronized with features must be under epics. Requirements synchronized with user stories can be under features, or at the top level, but not under epics. ALM Octane Synchronizer retains the hierarchy during synchronization. The three-level hierarchy can be stored in any requirement folder or sub-folder. In ALM Octane, the synchronized tree is stored under the Backlog root. ALM Group requirements >> ALM Octane epics. ALM Functional requirements >> ALM Octane features. ALM Performance and Testing requirements >> ALM Octane user stories. The requirements ALM Group 001 (epic) and ALM Group 002 (epic) are created on ALM Octane as two sibling epics under the root of the ALM Octane backlog tree. 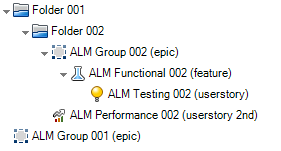 The requirement ALM Functional 002 (feature) is created as a feature under the epic ALM Group 002 (epic). The requirement ALM Testing 002 (userstory) is created as a user story under the feature ALM Functional 002 (feature). The requirement ALM Performance 002 (userstory 2nd) is created as a user story under the root of the ALM Octane backlog tree. Check whether you have releases or sprints/cycles with the same names defined in both ALM and ALM Octane. If you do, we recommend that in the release synchronization link, you select the Map pairs of new releases and sprints/cycles with identical names option. The data from the dominant endpoint is then used for all release entities, overriding any data in the other endpoint. If identically named releases or sprints are found and are not mapped, these releases or sprints are not synchronized at all and a "duplicate entities" error is generated in the Run Report. This is because ALM Octane Synchronizer tries to handle the release as a new record, creating it in the destination endpoint. The synchronization fails because the destination endpoint already has a release or sprint/cycle with the same name. If you later change the name of one of the releases or sprints, so that the duplication does not occur, the ALM Octane Synchronizer re-creates it in the destination endpoint. When mapping, ALM Octane Synchronizer checks only the releases that are included in the synchronized time frame. Releases or sprints/cycles with identical names are not mapped if they are in a past release (or a release whose end date is older than the one you specified for synchronization). For details on synchronizing past releases, see Synchronize past releases. The two releases are mapped. All data in the ALM release Release_1.3 is overwritten by the data in the ALM Octane release Release_1.3. An ALM release named Release_1.3, whose end date is July 20, 2017. An ALM Octane release named Release_1.3. whose end date is July 30, 2017. You select Synchronize past releases. End date can be this date or later: July 25, 2017. You select the Map pairs of new releases or sprints found with identical names option in the Rules tab. The ALM release is not relevant for mapping, because it is too far in the past. However, synchronizing Release_1.3 to ALM fails because it tries to create a release on ALM with a name that already exists. In ALM, modify the fields listed in the following table. If a field does not already exist in ALM, create a user-defined field to correspond to this data in ALM Octane. For details about mapping fields after setting up your link, see Edit field mapping. Defining fields as Lookup List fields lets you have empty lists, but still use this field for grouping in ALM. Define as a Lookup List field. Configure ALM to Allow Multiple Values and not to verify this value. Tip: Alternatively, when editing your link, map the ALM Octane Application module field to the ALM Product field. Define as a User List field. Blocked Define as a String field. Configure ALM not to verify this value. Rank Define as a Number field. Story points Define as a Number field. Note: Required for requirements being synchronized as features. Tip: You may want to create an additional user-defined field to distinguish between entities created directly in ALM and those synchronized from ALM Octane. To do so, create a field in ALM named Creation Method. Later, when you are mapping fields, assign a constant value of created by ALM Octane Synchronizer. For details about assigning constant values, see Edit field mapping. If you synchronize with an ALM project that uses version control, ALM Octane Synchronizer conforms to the versioning rules. Changes made by the synchronization process are checked in with a comment: Modified by Synchronizer. 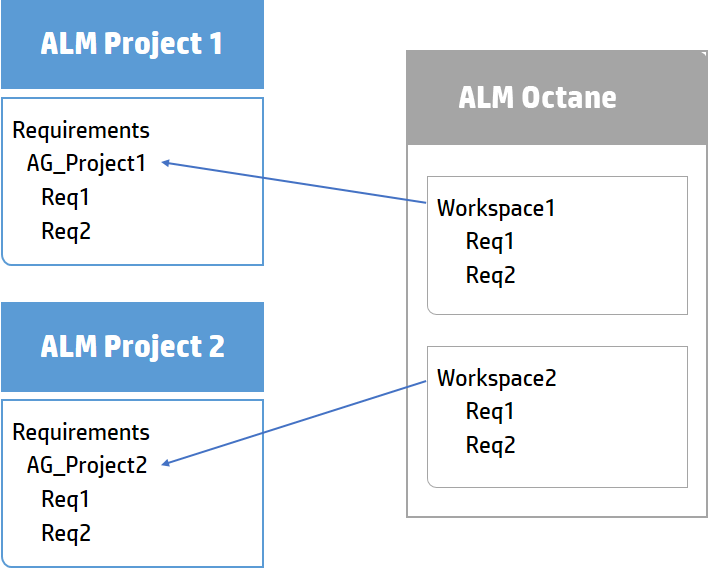 During synchronization, ALM Octane connects to ALM using the credentials of an ALM user that you specify. When synchronizing an entity that is checked out by that user, the entity is updated and checked in. When synchronizing an entity that is checked out by a different user, the ALM entity is not modified. If the synchronization is governed by the ALM Octane side, a synchronization error occurs due to the locked entity in ALM. If the synchronization is governed by the ALM side, the ALM Octane entity is updated based on the last checked-in version on ALM. Epics and feature names must be unique in both ALM and ALM Octane, and team names must be unique in ALM. If duplicate values are found during synchronization, the related record is not synchronized. In ALM Octane, records assigned to a specific feature must also have an epic defined. If you synchronize features, you must also synchronize their epics. Therefore, if you map epic and feature fields, we recommend making them required fields in ALM to avoid synchronization errors. Note: Avoid special characters (~! @#$%()^&) in attachment names, as these may cause unexpected behavior during synchronization. ALM Octane Synchronizer supports a maximum record size of 12 MB. This means that synchronizing records larger than 12 MB will cause errors. If you have records that are larger than 12 MB, move some of the data from the Description, Comment, or any other custom free text field, to a separate file. Then, add the file to the record as an attachment. Attachment sizes are not included in the maximum record size, though they are synchronized between the endpoints.